Tri-Color Inkjet Cartridge compatible with the Lexmark (Lexmark#20) 15M0120 : Business Express, Inc.
Lexmark 20 15M0120 Remanufactured Color Ink PR (275 Yield). 15M0120 Tri-Color Inkjet Cartridge compatible with the Lexmark Z42/ Z43/ Z45/ Z51/ Z52/ Z53/ Z54/ Z705/ Z715/ Z82/ X84/ X85/ X4250/ X4270/ X125/ X63/ X73/ X83 All-In-One/ P122 PhotoJet Printer/ P3120/ P3150/ P707. The use of compatible supplies does not void your printer warranty. 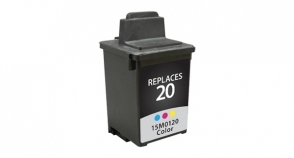 Compatible ink refill kit for Lexmark� 70, 50.